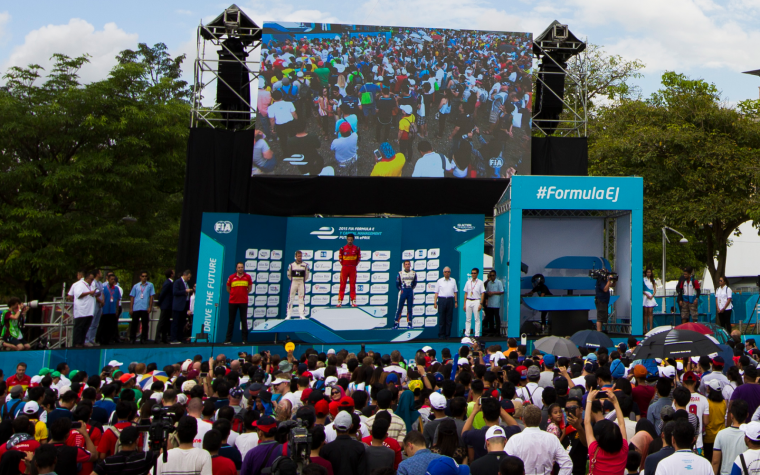 After an enthralling Putrajaya ePrix, in which Lucas di Grassi was victorious and several other front runners hit problems, e-racing.net’s managing editor Renate Jungert and senior editor Laurence Thorn have come together to discuss their top moments from the race. LT: There are multiple contenders for this. Sam Bird and Stephane Sarrazin’s drives up through the field were impressive, as were the performances of Antonio Felix da Costa and Loic Duval. Robin Frijns put in a brilliant display to finish on the podium – however I have to go for Lucas di Grassi here. After all the talk of Renault e.Dams being the new dominant force in FE, Lucas took it to them in both qualifying (where his first two sectors were quicker than Buemi before he touched the wall and lost time) and the race, where he heavily pressured Prost in the first stint and then passed the Frenchman in the second as Prost managed his battery. A simply brilliant race from di Grassi, who was a deserving winner. RJ: It’s indeed hard to choose only one, we had some great and outstanding performances in a field that had to fight against setbacks of all sorts. Lucas di Grassi did everything right and took the well-deserved victory, and also Sam Bird did a great catch-up from the midfield onto the podium. However, my driver of the day is Robin Frijns: the rookie qualified in the top ten in what was only his second Formula E weekend and, most impressively, he managed to drag his car around the circuit with a broken suspension during the last three laps. The Dutchman claimed his first podium finish, and that in a manner that definitely deserves my vote. LT: There were no storming starts in this race like Nick Heidfeld’s last time, however Sebastien Buemi got a very smooth getaway from pole position, cancelling out any advantage Duval or da Costa may have had by Stephane Sarrazin’s aborted start leaving a gap on the front row. Buemi’s start was the foundation of his strong first stint. RJ: In this race there were indeed less impressive starts, and the one that stands out most was Buemi’s fast getaway. Before the battery problem struck his e.dams car, the Swiss was displaying his usual speed, with the foundation laid by pulling away quickly and creating a gap from the start on. 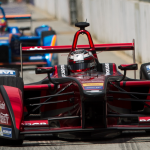 LT: As usual in Formula E, there were many brilliant moves to marvel at. Loic Duval made a brave move for second place on Nicolas Prost on lap 26, sticking around the outside of Prost on the curved run down to turn 7 before darting to the inside at the last moment and making the pass. However one move was better for me: Lucas di Grassi’s pass on Antonio Felix da Costa on lap 19 at the same place. This time, di Grassi clung to the inside of the track on the way into turn 7, before darting across the front of the Portuguese driver’s car and getting the move done under braking for the corner. Impressive racing. RJ: It is hard to say in such an entertaining race with battles all over the place, but I am going for the aforementioned move of Duval on Prost for second place in lap 26. Simply stunning, that one. LT: Where to begin? This race was full of surprises, including both e.Dams cars suffering mechanical issues, neither Dragon car finishing, and both Bird and Sarrazin driving up through the field to finish in the top 4. However, Robin Frijns’ heroic job in driving a badly-crabbing car to the finish – and still getting on the podium – was the biggest surprise for me. I simply did not know that could be done. What a driver! LT: It has to be Buemi. Pole again, leading the race again at the halfway stage – but unlike in Beijing, he could not keep that lead in the second half of the race as a software issue caused him to slow dramatically and then stop on track. While he could get going again, and set fastest lap during the race, the issue would reoccur and Buemi would finish 12th, outside the points. RJ: I agree, that has to be Buemi. The man did everything right and was set to dominate the race like he did in Beijing, however, his normally so reliable e.dams car was struck by technical gremlins so that he finished outside the points instead of on the podium. 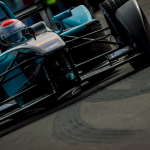 LT: Last season, Nelson Piquet Jr showed that he was one of the battery management masters in Formula E. This season it is no different – and it seems it will be even more important as he and the NEXTEV team try to come to grips with a car that is struggling for pace and reliability. Piquet was able to wait until lap 20 of 33 before making his car swap – by far the longest of anyone – and this helped him reach 8th by the end as cars ahead ran into issues. An honorary mention to Frijns who was able to wait until lap 17 before stopping, while most of those ahead stopped on the previous lap. RJ: I’m going for Frijns. We are already used to seeing Piquet Jr lasting longer than his competitors, however, considering that Frijns is a rookie and battery management requires a great deal of skill, I’ll give the honours to him this time. LT: There can only be one rookie of the race. While Villeneuve finished just outside the points, hampered by a lack of practice running, and Berthon struggled to a lapped 15th, Robin Frijns put in a spectacular performance to finish 3rd despite the aforementioned touch with the wall that damaged his suspension. He started 8th, made some good overtaking moves during the race, and was also helped by accidents and incidents for those ahead, on his way to a well-deserved 3rd place. RJ: That was undoubtedly done by Frijns. There is little to add to what was already said: A good qualifying result laid the foundation for remaining in the top ten during the race, and he managed to nurse his damaged car across the finish line for his first podium finish. Hats off.